For alternating electric current, RMS is equal to the value of the direct current that would produce the same average power dissipation in a resistive load. In estimation theory, the root mean square error of an estimator is a measure of the imperfection of the fit of the estimator to the data. The RMS value of a set of values (or a continuous-time waveform) is the square root of the arithmetic mean of the squares of the values, or the square of the function that defines the continuous waveform. In physics, the RMS current is the "value of the direct current that dissipates power in a resistor." The RMS over all time of a periodic function is equal to the RMS of one period of the function. The RMS value of a continuous function or signal can be approximated by taking the RMS of a sequence of equally spaced samples. Additionally, the RMS value of various waveforms can also be determined without calculus, as shown by Cartwright. In the case of the RMS statistic of a random process, the expected value is used instead of the mean. Sine, square, triangle, and sawtooth waveforms.
) and the period (T); illustrated here with a = 1. Graph of a sine wave's voltage vs. time (in degrees), showing RMS, peak (PK), and peak-to-peak (PP) voltages. D is the duty cycle or the proportion of the time period (1/f) spent high. 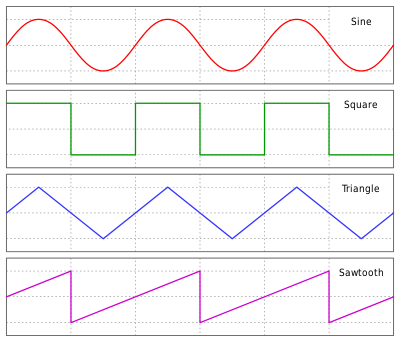 Waveforms made by summing known simple waveforms have an RMS that is the root of the sum of squares of the component RMS values, if the component waveforms are orthogonal (that is, if the average of the product of one simple waveform with another is zero for all pairs other than a waveform times itself). is the alternating current component of the signal. So, the RMS value, IRMS, of the function I(t) is the constant current that yields the same power dissipation as the time-averaged power dissipation of the current I(t). This equation can be used for any periodic waveform, such as a sinusoidal or sawtooth waveform, allowing us to calculate the mean power delivered into a specified load. Both derivations depend on voltage and current being proportional (i.e., the load, R, is purely resistive). Reactive loads (i.e., loads capable of not just dissipating energy but also storing it) are discussed under the topic of AC power. where t is time and ω is the angular frequency (ω = 2π/T, where T is the period of the wave). Where IP represents the peak current and VP represents the peak voltage. Because of their usefulness in carrying out power calculations, listed voltages for power outlets (e.g., 120 V in the USA, or 230 V in Europe) are almost always quoted in RMS values, and not peak values. Peak values can be calculated from RMS values from the above formula, which implies VP = VRMS × √2, assuming the source is a pure sine wave. Thus the peak value of the mains voltage in the USA is about 120 × √2, or about 170 volts. The peak-to-peak voltage, being double this, is about 340 volts. A similar calculation indicates that the peak mains voltage in Europe is about 325 volts, and the peak-to-peak mains voltage, about 650 volts. RMS quantities such as electric current are usually calculated over one cycle. However, for some purposes the RMS current over a longer period is required when calculating transmission power losses. The same principle applies, and (for example) a current of 10 amps used for 12 hours each day represents an RMS current of 5 amps in the long term. The term "RMS power" is sometimes erroneously used in the audio industry as a synonym for "mean power" or "average power" (it is proportional to the square of the RMS voltage or RMS current in a resistive load). For a discussion of audio power measurements and their shortcomings, see Audio power. where R represents the ideal gas constant, 8.314 J/(mol·K), T is the temperature of the gas in kelvins, and M is the molar mass of the gas in kilograms per mole. The generally accepted terminology for speed as compared to velocity is that the former is the scalar magnitude of the latter. Therefore, although the average speed is between zero and the RMS speed, the average velocity for a stationary gas is zero. When two data sets—one set from theoretical prediction and the other from actual measurement of some physical variable, for instance—are compared, the RMS of the pairwise differences of the two data sets can serve as a measure how far on average the error is from 0. The mean of the pairwise differences does not measure the variability of the difference, and the variability as indicated by the standard deviation is around the mean instead of 0. Therefore, the RMS of the differences is a meaningful measure of the error. and N is number of samples and FFT coefficients. From this it is clear that the RMS value is always greater than or equal to the average, in that the RMS includes the "error" / square deviation as well. Physical scientists often use the term "root mean square" as a synonym for standard deviation when it can be assumed the input signal has zero mean, i.e., referring to the square root of the mean squared deviation of a signal from a given baseline or fit. This is useful for electrical engineers in calculating the "AC only" RMS of a signal. Standard deviation being the root mean square of a signal's variation about the mean, rather than about 0, the DC component is removed (i.e. RMS(signal) = Stdev(signal) if the mean signal is 0). ^ a b A Dictionary of Physics (6 ed.). Oxford University Press. 2009. ISBN 9780199233991. ^ Cartwright, Kenneth V (Fall 2007). "Determining the Effective or RMS Voltage of Various Waveforms without Calculus" (PDF). Technology Interface. 8 (1): 20 pages. ^ Nastase, Adrian S. "How to Derive the RMS Value of Pulse and Square Waveforms". MasteringElectronicsDesign.com. Retrieved 21 January 2015. ^ "Make Better AC RMS Measurements with your Digital Multimeter" (PDF). Keysight. Keysight. Retrieved 15 January 2019. ^ Chris C. Bissell and David A. Chapman (1992). Digital signal transmission (2nd ed.). Cambridge University Press. p. 64. ISBN 978-0-521-42557-5.